How Golf Balls Are Made - Materials and History Explored! When the game of golf began some 6 centuries ago, the golf ball that was initially used was literally carved out of a solid piece of hard wood. It was a painstaking process so, understandably, relatively few were made each year. Fast forward to the 21st century. The golf ball industry is now enormous. As of 2017, golf ball sales alone accounted for fully one-third of the entire $2.6 billion golf equipment field. That’s over $850 million per year. 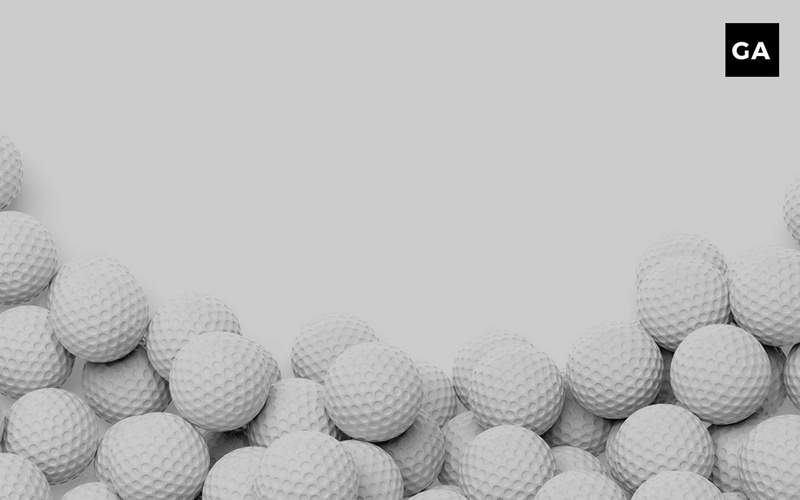 It is now estimated that approximately 840 million golf balls are manufactured every year. So, how are golf balls made? We’ll take a look at how golf balls are made today but, before we do, it will be interesting and informative to trace the history of golf ball manufacturing, from medieval Scotland to the present day. As with the evolution of all products over time, the development of the golf ball has been characterized by a steady progression of technological advancement. That progression wasn’t always frequent — some golf ball iterations lasted hundreds of years — but whenever alternative materials and improved processes were discovered, new and improved versions of the golf ball were brought to market. In fact, the history of golf ball manufacturing can be looked at, not only from the perspective of the dates during which each version was prevalent, but also from the point of view of the materials that were used with each successive ball introduction. Discounting the round shaped stones that early Scottish sheep herders hit into rabbit holes with their wooden staffs, the first real ball specifically manufactured for golf was actually made from wood. Skilled carpenters of the day, using hand tools, painstakingly carved balls out of hard wood, typically beech, and shaped them into round spheres to be used by golfers. There were obviously some significant drawbacks to these golf balls, however. Being made from wood, they eventually succumbed to moisture and from repeated blows from a club, and in time would simply break in half. Another downside was that the wooden surface of the ball was smooth. It would be another 200 years before it was discovered how slight indentations in the surface of the ball could enhance its flight characteristics. Consequently, wooden golf balls performed inconsistently in the air and only travelled relatively short distances. The first major golf ball innovation happened in 1618, with the introduction of the golf ball known as the “Feathery.” The Feathery was essentially a leather golf ball stuffed with either goose or chicken feathers. It consisted of three separate pieces of leather that were stitched together, stuffed with wet feathers and then painted. When the feathers dried, they expanded and gave the ball a rounded shape. The Feathery was clearly far superior to its predecessor and lasted for over 200 years, but it too had some significant deficiencies. Due to the time-consuming process needed to make one, they were very expensive. Unfortunately, this limited golf in that era exclusively to the rich. Adjusted for time, a Feathery cost about the equivalent of $10.00 per ball in today’s economy. And because of the effort involved in making a single Feathery, a skilled ball maker could only make about four of them per day. It was a far better solution than the wooden ball, but the fact that it also wasn’t perfectly round, gave it an irregular flight as well. Durability was also limited…if it got wet, it often simply came apart. Possibly the most consequential golf ball introduction of all time occurred in 1848. Dr. Robert Adams Patterson invented a golf ball out of Gutta Percha using the dried sap of the Sapodilla tree, native to Malaysia, which he found to have a rubber-like quality. This ball would become known as the “Gutty.” By heating this “rubber” and pouring it into round molds, they were able to produce golf balls in large quantities, which allowed the game to spread to the masses. The Gutty ball is considered to be one of the primary factors that contributed to the expansion of the game and its popularity. An interesting discovery was made during the Gutty’s reign. Almost by accident, they found that the smooth exterior of a new Gutty would cause it to veer off path in the air unlike older ones that had been scuffed up from play. So they then began “hammering” the Gutty during production to intentionally fabricate “imperfections” in the surface to replicate the more stable flight performance of the nicked-up golf balls. Soon, golf ball manufacturers began chiseling and etching different textures into the Gutty surface, attempting to fine tune the pattern that would be most conducive to consistent and stable flight. This was the precursor to the dimple patterns that we are familiar with today, and was eventually incorporated into the mold that they used to make the Gutty. Sometime in 1898, as the story goes, Coburn Haskell and Bertram Work were preparing to play a round of golf together. While waiting for Work (an employee of the Goodrich rubber company) to arrive, Haskell passed the time by winding a long rubber band into the shape of a ball. He bounced it on the ground and discovered that it bounced much higher than he had anticipated. He then showed this to Haskell who conceived the idea of putting a hard cover around the rubber to keep it from unraveling. Eventually, these rubber strands were wrapped around a rubber core, covered with the hardened sap from a Balata tree, and soon, the “Haskell” golf ball was invented. The Haskell ball, with several modifications along the way, lasted for several decades. After that, the next wave of golf balls really didn’t involve drastically different design changes. What ushered in the modern era in the evolution of the golf ball was an advancement in the materials used. Today’s golf balls are vastly superior to their ancestor versions due to the use of space age plastics, silicone, and improved rubber. Golf balls can now be “customized” for anyone, by employing materials like surlyn and urethane to suit various levels of golfers. They also feature multiple layers, a differentiation again designed to allow golfers of various skill levels to get the most out of their chosen golf ball. The golf ball section of your local golf store will display 2-piece balls, 3-piece balls, and 4-piece balls (one company even has a 5-piece ball). Each one of these is tailored to golfers based upon their skill level and their swing speed, and whether they are looking for added control, added spin, or added distance. The process used to manufacture golf balls today is a marvel of 21st century methodologies, materials, and aerodynamics. The actual step-by-step process is far too detailed to adequately describe here, but can be summarized by looking at which type of ball is being produced. Playing with the correct ball for your skills will be hugely beneficial to your gameplay. A 2-piece ball consists of a solid rubber core surrounded by a durable thermoplastic cover. The rubber starts out as a hard block, which is then heated and pressed to form a sphere. This core is then placed in an injection mold, after which hot plastic (surlyn or urethane) is injected and forms a hard, dimpled coating around the core. The ball is then painted, stamped with a logo, and given a glossy coat. 2-piece balls are generally made for distance and longer durability. 3-piece golf balls consist of a solid core with a molded rubber outer core and the final cover, while the 4-piece ball has the same solid core and rubber outer core, but it includes a second coating over the molded rubber core before the final cover is applied. This construction creates a softer feel for the golfer, along with higher spin rates, which together provide more control. The game of golf has had a fascinating history since its humble origins 600 years ago. No less fascinating is the evolution that the golf ball has undergone during that time. But what does the future hold for the golf ball? Only time will tell. It will be interesting to watch as the perpetual advance of high technology attempts to influence the continued forward progress of the golf ball. Best Golf Balls Available in 2019! Bill is an expert in all things golf. With over 40 years of experience, he is an excellent golfer (playing to a handicap of 8) highly skilled in golf equipment, swing mechanics and instruction methodologies. Bill is a regular contributor imparting his knowledge and expertise to the readers at Golf Accessories Reviews.